The National Energy Board has recommended the approval of Kinder Morgan’s Trans Mountain Expansion Project with 157 conditions. Yesterday’s decision brings the regulatory process created by Stephen Harper to an end. The decision is now squarely in the lap of the Trudeau government, although the government of British Columbia also needs to take a stance. Trudeau has created two supplementary processes: a climate test, which is underway for Trans Mountain, and 3-person consultation panel. The climate test will look at the impact of the pipeline on upstream GHG emissions, and a draft of that analysis was also released yesterday. The 3-person panel will be consulting further with First Nations, affected communities, and the public, and is charged with reporting by November 1. These supplementary processes can provide the basis for a rationale for Trudeau departing from the NEB recommendations, but there’s no guarantee they will be used that way. The BC government also needs to decide whether the project is in BC’s interest. Premier Clark was originally hoping for some political cover from that difficult political choice through the Equivalency Agreement, which handed full responsibility for project review and assessment to the federal government. In January, the BC Supreme Court invalidated that agreement. The BC government has initiated a process for its review, which will include First Nations consultation, but has yet to provide a timeline for completion. The court’s ruling clarified that BC can impose it’s own conditions on the pipeline in BC, but not in a way that has the effect of denying approval to a federally-approved pipeline. These additional processes don’t change the fact the decision ultimately comes down to an exceptionally challenging political choice by Prime Minister Trudeau. Trudeau has repeatedly promoted the importance of supporting the Alberta oil sector by diversifying the market for oil sands. But he also ran on the slogan that “governments grant permits, but communities grant permission.” More than a dozen lower mainland municipalities are opposed to the project, including Burnaby, Surrey, and Vancouver. Vancouver Mayor Gregor Robertson, a close political ally of Trudeau, just launched a major campaign against the pipeline. Public opinion in BC is opposed to the pipeline by a margin of 45% to 36%, and opposition appears to be more intense in the vote-rich Lower Mainland. Trudeau has also pledged reconciliation with First Nations and the full implementation of the UN Declaration on the Rights of Indigenous People. The declaration calls for “free, prior, and informed consent,” a departure from current Canadian law emphasizing consultation and accommodation. A number of First Nations, including the Coast Salish groups Tsleil-Waututh, Squamish, and Musqueam in the Burrard Inlet and surrounding areas, are vehemently opposed to the project. The Tsleil-Waututh have crafted an elaborate legal strategy to defend their rights and resist the construction of a new pipeline, including forging an alliance with indigenous groups on the Salish Sea from across the 49th parallel. 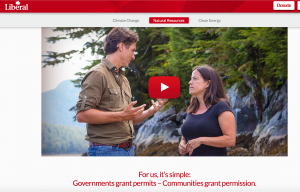 Trudeau has also sought to establish Canada as a leader in combatting climate change, and pledged to meet the national target of reducing emissions by 30% by 2030. It’s hard to see how enabling significant expansion of the oil sands, the fastest growing source of Canadian emissions, will put Canada on a path to compliance. Trudeau can’t keep pledging to do multiple incompatible things. To govern is to choose, and it’s close to time for him to make the difficult political choice on Kinder Morgan’s proposal. This entry was posted in Energy Pipelines. Bookmark the permalink. George, excellent thoughts on this incredible conundrum. The only comment I might make is to correct you on the legal gleaning. Delgamuukw in 1997 noted that the spectrum of “consultation” included “mere consultation, more than mere consultation and consent”. Tsilhqot’in in 2014 confirmed that consent applies as the consultation standard where the Nation has proven Aboriginal Title. So, Canada’s move towards the UNDRIP FPIC language is not inconsistent with the legal trend in Canada.